(Princess) Elizabeth Bibesco (1897-1945) was born Elizabeth Charlotte Lucy Asquith – she was the daughter of prime minister Herbert Asquith and his second wife, Margot Tennant. 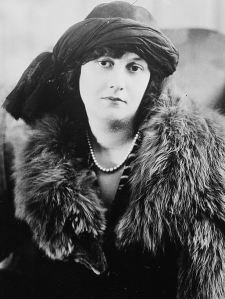 In 1919 she married Prince Antoine Bibesco, a Romanian diplomat based in London, and went with him to Washington and to Madrid. Antoine Bibesco was a friend of Proust’s, and Elizabeth captivated him (she wrote his obituary in New Statesman in 1922). She also published three volumes of short stories, including Balloons (which you can read here), a volume of poetry, four novels and two plays. She died of pneumonia in Romania (where she had spent the war years). She was connected loosely to the Bloomsbury group, and certainly knew both Virginia Woolf and Katherine Mansfield (with whose husband John Middleton Murry, she had a brief affair, as he in turn had a brief affair with DH Lawrence’s wife). There is a wonderfully tart letter from Mansfield to Bibesco here. You have found a picture of Marthe Bibesco (taken when she was in London to celebrate the birth of Elizabeth Bibesco’s daughter. There are many possible image of Elizabeth on line but perhaps the painting by Augustus John (1924) – pink dress and mantilla – would be a suitable one for this spot. Thanks – much appreciated – have replaced it with a correct photo.